Darcy law calculator - formula & step by step calculation to find the relationship between the fluid viscosity and the presssure drop over a given distance or the total discharge rate through a porous medium. Q = -kA(Pb - Pa)/μL. 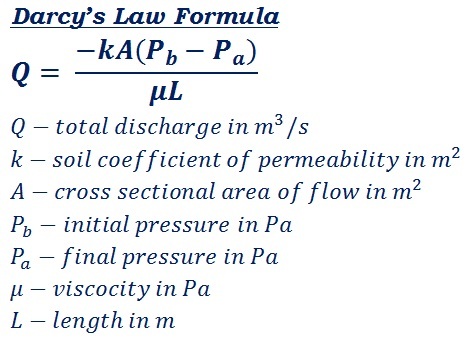 The porous or soil coefficient of permeability k in m2, cross sectional area to flow A in m2, initial pressure Pb in Pa, final pressure Pa in Pa, fluid viscosity μ in Pa & total length of the pipe or medium in m are the key terms of this calculation. In mechanical engineering, the below mathematical formula is used to calculate the relationship between the fluid viscosity and the presssure drop over a given distance. In the field of mechanical engineering, sometimes it's important to analyse the relationship between the fluid viscosity and the presssure drop over a given distance for the design & study the pipe lines. The above formula & step by step calculation may useful for users to understand how the values are being used in the formula, however, when it comes to online for quick calculations, this fluid viscosity Vs pressure drop relationship calculator helps the user to perform & verify such calculations as quick as possible.